Clearchoice Services is locally owned and operated by Steve & Theresa Jagman. Since the beginning we have focused on building a reputation of quality workmanship and friendly service, determined to earn your confidence and trust. Whether it’s window cleaning, gutter cleaning, house washing, roof cleaning or pressure washing, you’ll surely see our dedication to customer service and quality workmanship. This is an outstanding company. They are family owned and extremely attentive and professional. They have performed both the window cleaning and exterior softwash services on our house. Meticulous and also very pleasant to work with. It's rare to find a company that is both fairly priced and delivers exceptional work. We will only work with Clearchoice Services for all future window and exterior cleaning. Simply the Best! 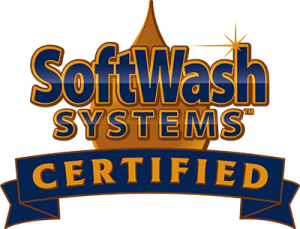 Clearchoice used the softwash system on the exterior of our house and cleaned our windows. They did an excellent job cleaning and left no mess or signs they were here other than exceptionally clean windows! The exterior of our home had really accumulated dirt and was beginning to acquire some mold. They were able to clean everything up beautifully. I will definitely call Clearchoice the next time we have similar work done! Thank you so much for cleaning our windows! They look great 🙂 Clearchoice Services were extremely thorough and professional. Everyone was very polite and respectful to us and our property. I will definitely be using them in the future and would recommended them to anyone! Excellent service. Clearchoice Services washed my windows & screens, cleaned the gutters, and soft washed my house. They are very professional and I couldn't be more pleased with their work. My house looks brand new. Highly recommend Clearchoice Services. Great friendly staff. Accommodated my busy schedule to do a great job washing my windows. Job was done with perfection. Clearly I made the right choice. Clearchoice Services, Inc. did an awesome job making my house shine! I had them do the deluxe window cleaning (inside, outside, sills & screens) and they soft pressure washed the exterior of our home. I would definitely recommend them and their services and will surely use them again in the future. My house looks great! We are centrally located in Woodstock, IL, and offer services in Northern Illinois and Southern Wisconsin.